The International Collegiate Programming Contest (ICPC) Southern Africa Regionals was held last Saturday on October 20. There were 85 teams from Angola, Ethiopia, Kenya, and South Africa that submitted at least one possible solution to the programming problems provided within the allotted time of 5 hours. The contest turned out to be unusually tough, with only 32 teams submitting at least one correct solution. 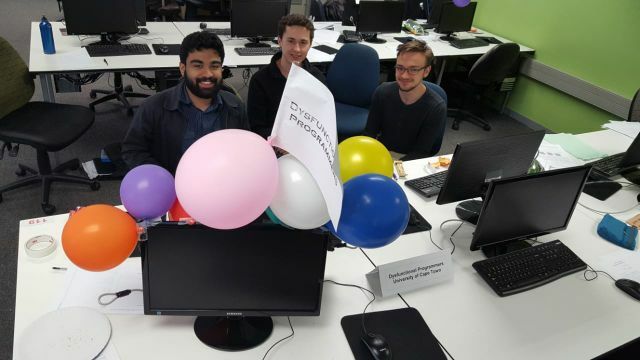 The UCT team “Dysfunctional Programmers” consisting of 2nd year students Bronson Rudner, Yaseen Mowzer, and David Broodryk was the first ever in the SA regionals history to have solved all eight problems, and even had an hour to spare! They will represent UCT at the world finals in Portugal in April 2019, competing against about 140 other winning teams from the other world regions that have typically higher participation rates, counting to a total of about 50000 students who tried to qualify for the finals, originating from about 1100 universities in some 111 countries. Last year, “Dysfunctional Programmers” came in first in the Western Cape but second overall due to a time difference, and their study and contest training practice over the past year surely did pay off. The second-best UCT team, 3rd at the Western Cape site, and 5th in the overall classification (with time as tiebreaker for positions 3-6) was “ErCerPerCer”, consisting of Matthew Morris, Jeremy Wilkinson, and Claude Formanek, holding their ground cf. last year. The best UCT team of first-time entrants was the “Ketameme” team, consisting of Courtney Wadey, George Rautenbach, and Rubin Ally. Noteworthy mentions are that both Angola and Ethiopia made it into the top-10, also here demonstrating that practice improves results (they had national ICPC contest earlier in the year). The 2018 contest problems and the scoreboard can be accessed from the main Southern Africa Regionals site at http://acm.cs.up.ac.za/.